Ageing is a natural process but many of our patients want to continue to look and feel good with a healthy, natural glow. Our skin reacts to the influences of daily life, including the sun, smoking and, unfortunately, the ageing of the facial muscles. One of the beauty treatments on offer to help fight the ageing process is Botox. Skilled application of Botox helps to relax the muscle tissue which in turn can help prevent ageing associated with the daily influences of life. It is applied in the region of the face where dermal collagen has weakened. These areas are most commonly the forehead, upper lip and around the eyes. Dermal fillers are an excellent addition to Botox treatments. They help to restore a soft, smooth surface texture to deeply lined areas of the face. These procedures are painless with noticeable results after 10-14 days leaving a natural radiant appearance to the treated areas. 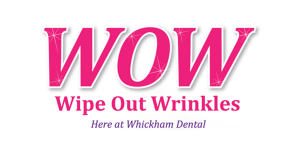 At Whickham Dental we have created our WOW Club, where our patients can benefit from the expertise of our facial rejuvenation team who are skilled in the provision of Botox and dermal filler systems.